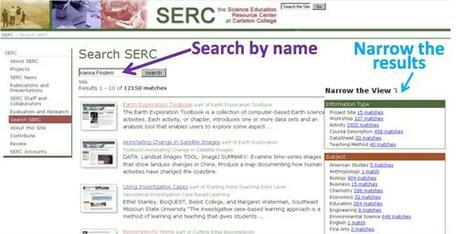 You can find people of interest and their contributions to SERC by performing a site wide search, or, if they have contributed materials, they may be featured in one of our Profile Pages. You can perform a site-wide search for people and their contributions to SERC's sites and projects such as activities, course descriptions, essays, and teaching methods. Simply type in the name of the person of interest and click the search button. The list of results may be narrowed by resource type, subject, or location. Or search within our collection of community Profile Pages. In addition to our site-wide search we have a separate search interface for our collection of Profile pages. With this tool you can search not only on a name, but on others terms that might appear in a profile pages. For example, you could search on the name of an institution to find all the people whose profile mentions that institution as a quick way to identify faculty from a particular university. Profile pages allow visitors to SERC-hosted sites to understand how their colleagues have shaped the community resources on our sites. While many of our sites are resource-focused, connecting to the people behind the resources is key to understanding what our projects are really about. 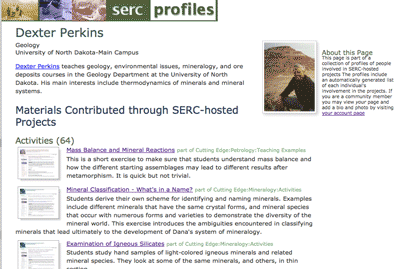 Each profile page provides links to all the materials a particular person has contributed through SERC hosted projects. It also documents the workshops they've participated in, the communities they belong to and the projects they lead. You can use a profile page to get to know your colleagues in preparation for a meeting, or to find new resources from people who's contributions you value. If you're involved in a SERC-hosted project: attended a workshop, contributed an activity, then you likely already have a profile page. If you visit your account page you'll find a link to your profile page. From your account page you have the option to add a short biographical description and a photo that will appear at the top of your profile page. See the example profile pages for inspiration. Your bio is not an appropriate place to advertise your business or share information that isn't relevant to either SERC-hosted projects or the communities they support. We will remove bios that abuse this facility. Activity and course descriptions, essays and other submitted materials include author profile links. Search results highlight relevant profile pages when you search on the name of a profiled person. We hope profile pages will be a useful tool for you to better understand the network of colleagues that you can connect with and will provide a new route to finding relevant materials across our sites.